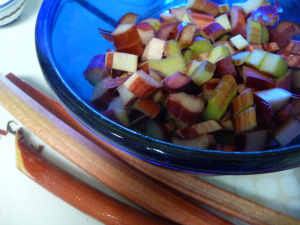 Just in case you’re lucky enough to have some rhubarb around! 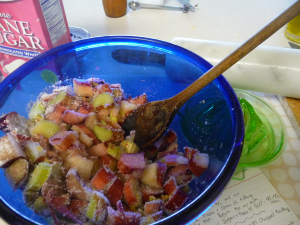 After reading my own post below, well, I just had to make my annual rhubarb pie! It’s really a half-pie, or anyway a top-crust only pie, with a little border too. 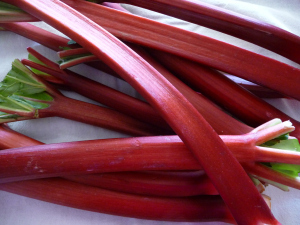 Thank you, Maggie, for the rhubarb! It’s the season to celebrate rhubarb once again — and what better way than pie? After all, its nickname is pie plant, and every spring I seem to write about rhubarb pie — so why break the tradition? 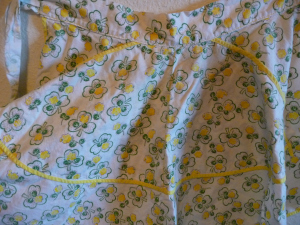 This time I decided to just take some photos along the way and show you how I spent my Sunday afternoon, along with some simple instructions if you’d like to make a delicious late-spring pie. Chop the rhubarb — you’ll need 4 cups or a little more for a small 8-inch pie — and make enough pie dough for a double crust, pat into two circles and refrigerate for an hour. Then go for a walk while the dough is chilling. Sunday afternoon was the perfect time for pie making. YES, IT’S OFFICIALLY AUTUMN, and the change of the seasons and cooler days call me back to baking once again (not that I’ve ever left it entirely). In the late summer/ early fall, I made some Zwetchgenkuchen with the beautiful Italian plums, but now that the plums are all gone from the trees, and I’ve said farewell to summer, my fruit dreams turn to apples and pears. Next week, when I visit my daughter in Arkansas, we plan to make an apple pie together, so I was recalling a post I wrote here back in 2007 that spoke of my “one-per-season pie calendar” and featured the marvelous Pie Queen Reeb Willms with her recipe for apple pie. You can read it here. Another must-bake for me in the autumn is the round challah with raisins. Along with apples and honey, it signifies the sweet and spirit-nourishing tradition of Rosh Hashonah, the Jewish New Year. My round challahs are never quite symmetrical, but then, it really doesn’t matter! In fact, circles seem to be a theme here — appropriately, as in the autumn, we are so aware of the circle of seasons. So, even if you don’t do any baking this season, do enjoy a wonderful crisp, juicy, sweet (or sweet-tart) apple — and roll with the season!